In this section we discuss two basic concepts that are derived from the rules: life and death and territory. White to play and capture Black's stones. 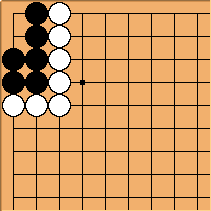 Where and in what order has White to play in order to capture the Black stones? Can Black save his stones? A group of stones that cannot avoid capture is said to be dead. Turn a group into a dead group is called to kill. 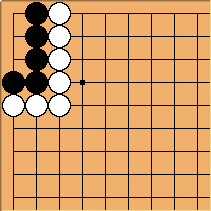 Here it starts to become interesting: Where has White to play in order to kill the Black stones? 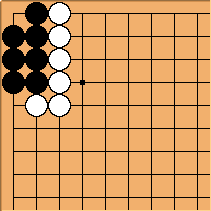 Where can Black play in order to prevent his group from being killed? A group that is safe from capture is called alive. The most typical alive groups are groups with two eyes. Both black groups are alive. If an area of empty points is surrounded by one player, in a way that he will always be able to fill it up with alive stones and his opponent will never be able to put down stones there without them being killed, such an area is called territory. 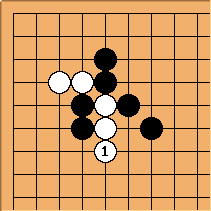 In common Go speech, all these black structures have formed territory, even if they do not fall under the strict definition given above. 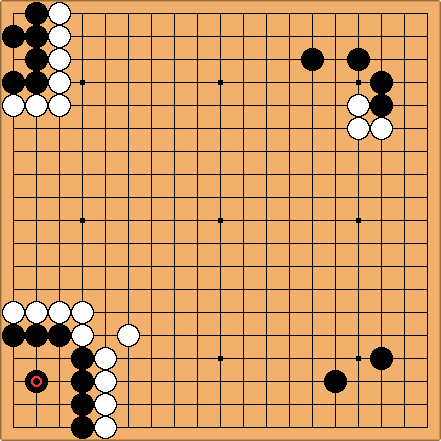 In the lower left, Black surrounds 11 points which he can fill at ease with black stones. White stones will not be able to survive in that area. 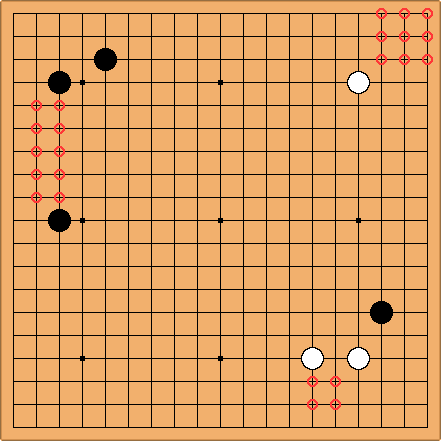 So, we say that Black has formed a territory of 11 points. But, there is a small catch. 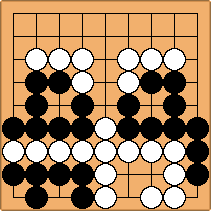 The upper left is a group with two eyes: even if Black passes, White will never put alive stones within the eyes and take the black stones away. However, neither can Black put a stone there, or his group is in atari. Strictly speaking, these two points should always be substracted from the counted territory (see group tax). Over time, the two points providing the final eyes for a group have been taken into account as territory for Black. Hence in the lower left, Black effectively has 11 points of territory. 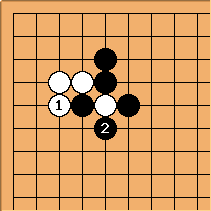 The upper right shows a stable configuration of black stones, meaning, they are very unlikely to die in their current position, because of the eyespace they have. 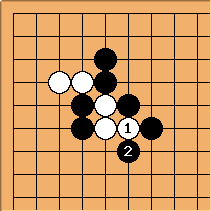 The area behind the lines, even though not clearly delimited, cannot be occupied by alive white stones, unless the Black group is surrounded and suffers from a lack of liberties. The lower right shows another stable configuration. If White stones reach the vicinity of this corner, the territory behind these two stones can be swept away. In all the above cases, the areas are surrounded by stable or clearly alive groups. It is a common mistake to view any half-surrounded area as territory. In this diagram, the three marked areas are not territory but a sphere of influence. A move in this area will have more or less difficulty living, depending on its colour. There is no way of telling that these points will definitely become black or white. White's stone has one liberty. After the - exchange, she has two liberties. Black's chains are separated and have a small number of liberties each. If instead White plays here, Black captures a stone and his chains are virtually unified, giving many liberties. 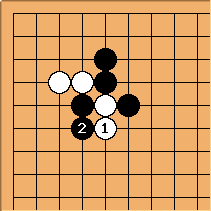 In this situation after the - exchange White still has gone from 2 liberties to 1 and will be caught in a ladder. Instead, here she extends her number of liberties from 2 to 4, leaving Black to play. White to play and decide the game by knock-out. Solution: cuts Black into two groups. Both groups now need to make two eyes with a or b. 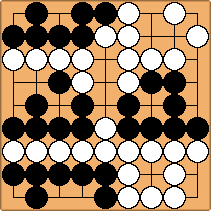 Black cannot do both, so one of the groups will die, giving White a definite victory. This is a comparable position to the above. Black must find a way to save his central stones or the game will definitely be over. After , a and b are available to Black in order to make two eyes. As the above diagrams suggest, to cut your opponent's groups is a major asset in reaching victory. Likewise, if you keep your groups connected, in general you need less moves to make life for your stones.